He repeated this question several times, rolling his feverish head from side to side, and then he dropped into a troubled sleep. I crept out of the room, and, having seen that he would be properly cared for, left the house. His words, however, rang in my ears for days afterwards, and assumed a deeper significance when taken with what was to come. 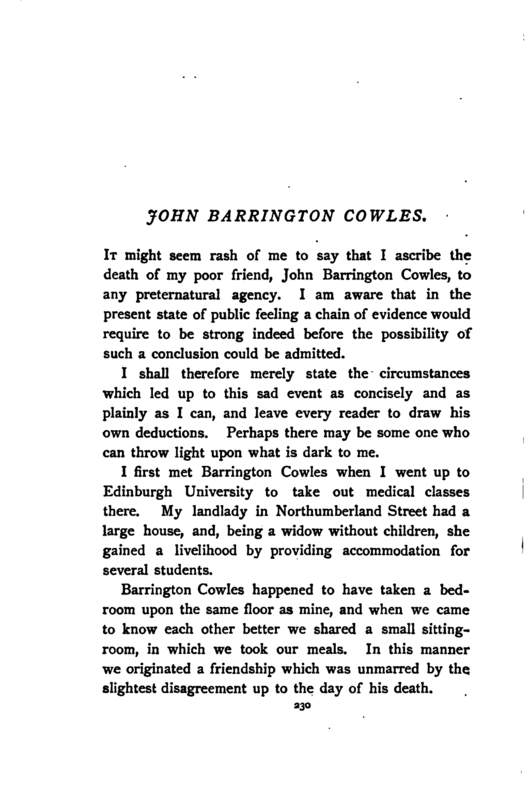 My friend, Barrington Cowles, had been away for his summer holidays, and I had heard nothing of him for several months. When the winter session came on, however, I received a telegram from him, asking me to secure the old rooms in Northumberland Street for him, and telling me the train by which he would arrive. I went down to meet him, and was delighted to find him looking wonderfully hearty and well. “On what, my boy?” I asked. I expressed my pleasure at the prospect, and endeavoured to speak as lightly as I could to Cowles upon the subject, but I felt depressed and anxious at heart. The words of Reeves and the unhappy fate of young Prescott recurred to my recollection, and though I could assign no tangible reason for it, a vague, dim fear and distrust of the woman took possession of me. It may be that this was foolish prejudice and superstition upon my part, and that I involuntarily contorted her future doings and sayings to fit into some half-formed wild theory of my own. This has been suggested to me by others as an explanation of my narrative. They are welcome to their opinion if they can reconcile it with the facts which I have to tell. I went round with my friend a few days afterwards to call upon Miss Northcott. I remember that, as we went down Abercrombie Place, our attention was attracted by the shrill yelping of a dog—which noise proved eventually to come from the house to which we were bound. We were shown upstairs, where I was introduced to old Mrs. Merton, Miss Northcott’s aunt, and to the young lady herself. She looked as beautiful as ever, and I could not wonder at my friend’s infatuation. Her face was a little more flushed than usual, and she held in her hand a heavy dog-whip, with which she had been chastising a small Scotch terrier, whose cries we had heard in the street. The poor brute was cringing up against the wall, whining piteously, and evidently completely cowed. I acknowledged that it would. The two began to chat together about some Aberdeenshire reminiscence, and I had time to observe Mrs. Merton, who had remained silent during our short conversation. She was a very strange-looking old lady. What attracted attention most in her appearance was the utter want of colour which she exhibited. Her hair was snow-white, and her face extremely pale. Her lips were bloodless, and even her eyes were of such a light tinge of blue that they hardly relieved the general pallor. Her dress was a grey silk, which harmonised with her general appearance. She had a peculiar expression of countenance, which I was unable at the moment to refer to its proper cause. She was working at some old-fashioned piece of ornamental needlework, and as she moved her arms her dress gave forth a dry, melancholy rustling, like the sound of leaves in the autumn. There was something mournful and depressing in the sight of her. I moved my chair a little nearer, and asked her how she liked Edinburgh, and whether she had been there long. When I spoke to her she started and looked up at me with a scared look on her face. Then I saw in a moment what the expression was which I had observed there. It was one of fear—intense and overpowering fear. It was so marked that I could have staked my life on the woman before me having at some period of her life been subjected to some terrible experience or dreadful misfortune. “Oh, yes, I like it,” she said, in a soft, timid voice; “and we have been here long—that is, not very long. We move about a great deal.” She spoke with hesitation, as if afraid of committing herself. “You are a native of Scotland, I presume?” I said. I was about to ask her the reason for this strange request, but when she saw I was going to address her, she rose and walked slowly out of the room. As she did so I perceived that the lovers had ceased to talk and that Miss Northcott was looking at me with her keen, grey eyes. “Come, Jack, you are not going to die any sort of death yet,” she said, tenderly taking his hand in hers. “I think she is wonderfully beautiful,” I answered guardedly. “I think she is very clever too,” I remarked. We then walked on for some time in silence. Then I knew that my poor colourless friend had been speaking to Cowles, but he never said anything more as to the nature of her communication. My companion went to bed early that night, and I sat up a long time by the fire, thinking over all that I had seen and heard. I felt that there was some mystery about the girl—some dark fatality so strange as to defy conjecture. I thought of Prescott’s interview with her before their marriage, and the fatal termination of it. I coupled it with poor drunken Reeves’ plaintive cry, “Why did she not tell me sooner?” and with the other words he had spoken. Then my mind ran over Mrs. Merton’s warning to me, Cowles’ reference to her, and even the episode of the whip and the cringing dog. The whole effect of my recollections was unpleasant to a degree, and yet there was no tangible charge which I could bring against the woman. It would be worse than useless to attempt to warn my friend until I had definitely made up my mind what I was to warn him against. He would treat any charge against her with scorn. What could I do? How could I get at some tangible conclusion as to her character and antecedents? No one in Edinburgh knew them except as recent acquaintances. She was an orphan, and as far as I knew she had never disclosed where her former home had been. Suddenly an idea struck me. Among my father’s friends there was a Colonel Joyce, who had served a long time in India upon the staff, and who would be likely to know most of the officers who had been out there since the Mutiny. I sat down at once, and, having trimmed the lamp, proceeded to write a letter to the Colonel. I told him that I was very curious to gain some particulars about a certain Captain Northcott, who had served in the Forty-first Foot, and who had fallen in the Persian War. I described the man as well as I could from my recollection of the daguerreotype, and then, having directed the letter, posted it that very night, after which, feeling that I had done all that could be done, I retired to bed, with a mind too anxious to allow me to sleep. Narrative of John Easterling, F.R.C.P.EDIN.